Saucepan, saute pan, skillet, grill pan – you’ll require all of them to complete your kitchen. There are cookware sets available on the market, but it’s quite difficult to find a set that contains every one of them. And no matter you find one, you’ll still need to buy at least one or more of them. Pick the best nonstick cookware along with your favorite cooking pans. That’s why here we have listed the best cooking pans from different categories so you can choose your required one. If you need a mini saucepan for cooking mini dishes, then Cuisinart 719-14 1-quart saucepan would be the perfect fit. The durable 18/10 stainless steel body comes with an aluminum-encapsulated base for faster and even heat distribution. Oven safe to 550-degree Fahrenheit. The cool grip handles provide a secure grip and stay cool on your stovetop. Besides the handles are precisely riveted for perfect balance. Tapered rim prevents spills and drips when pouring, and the tight-fitting stainless steel lid locks in moisture, nutrients, and flavor to ensure a delicious meal. Made of durable aluminum and backed by lifetime warranty. Oven safe to 350-degrees with no hot spots. Even heat base provides faster and even heat distribution. The nonstick body allows easy food release for hassle free cooking and quick cleaning. Besides, the nonstick coating is free from PFOA, lead, and cadmium so this saucepan is totally hygienic and safe for your health. Furthermore, non-stick interior requires less oil or fat for healthier and delicious cooking. Ergonomically stay-cool handle provides firm and comfortable grip. And the see through glass lid allows you to easily monitor your food when cooking. Introducing the number one saucepan in our list. This 3-quart 18/10 stainless steel pan comes with a thicker aluminum core for much faster and even heat distribution. While other stainless steel pans come with stainless steel handle, this one includes a phenolic handle that stays cool for much longer. And there is a clasp attached to the handle so you can hang it on your kitchen wall to save some drawer space. We mostly like this saucepan for it’s covered straining feature. The lid contains straining holes so you can pour water without spilling food on your basin. Besides the lid comes with a stay cool phenolic knob for easy pull-up. If you’re an amateur cooker or need a saute pan with better handling, then this dual handle 5.5-quart stainless steel pan would be the best option for you. This pan comes with a stay-cool riveted handle with a helper handle for more convenient lifting. Like other stainless steel pans, it also has an aluminum base for even heat conductivity and distribution. Oven safe to 550-degrees Fahrenheit and suitable for induction cooktop. Comes with a tight-fitting transparent glass lid that seals in moisture, flavor, and nutrients to ensure your foods are as delicious as you wanted it to be. Ever thought a saute pan will show you whether it is perfectly pre-heated or not? Yes, the T-FAL E93808 saute pan comes with thermos-spot indicator on the surface that shows when the pan is perfectly preheated for cooking. When the pan is preheated and ready for cook, the Thermo-spot patterns on the inner surface will disappear and turn into solid red, indicating that the pan has reached perfect temperature and ready for cooking. You can consider this nonstick pan as both a saute and omelet pan. When the surrounding body is made of aluminum, the base is made of magnetic stainless steel to make it compatible with any kind of oven and cooktop especially induction cooktop. Lodge is a hundred year name in the American cookware industry who are mostly famous for iron skillets. If you check the best seller skillets on Amazon, you’ll find that most of them are from Lodge. This 10.25 preseason cast iron skillet is totally non-stick without any presence of harmful materials. And you can easily clean it using a nylon brush and hot water. There is no need of any soap or dishwasher for cleaning. Brutally tough; you can go over decades with this skillet. The sturdy handle includes a hole for hanging on kitchen wall when not in use. Washing with soap or detergent will spoil the nonstick feature. This 12-inch skillet is pre seasoned with vegetable oil to ensure easy release of food and hygienic cooking. Compatible with any kind of oven and cooktop including induction cooktop. The best thing about this skillet is the handle. The handle comes with a red silicone handle holder that keeps the handle always cool and provides a secure grip. Although it’s pretty easy to clean with just a nylon brush and hot water, you shouldn’t use any soap or detergent to protect the non-stick features. No need to worry about durability. This skillet is made of refined cast iron so that you can go over decades with it. Grilling requires slow, even heat distribution and that’s why Lodge P12SGR3 12 -inch is made of rugged cast iron. Pre-seasoned with vegetable oil formula, so you don’t have to worry about hygiene issues. Long handle with helper handle allows easy pulling and hassle free cooking. The handle includes a hole for hanging. Oven safe to 500 degrees and compatible with induction cooktop. However, this grill pan isn’t dishwasher safe, and the seasoning will damage if you use soap or detergent. But it won’t be a problem as hand wash and hot water is enough for cleaning. Made of hard-anodized heavy gauge aluminum that ensures even heating and durability. Besides, it is dishwasher safe so you can clean it using soap or detergent. The best thing about this Calphalon grill pan is its three layers nonstick coating. While the first layer provides easy release, the other two layers ensure durability. Comes with a long riveted and stay-cool stainless steel handle for a firm and comfortable grip. Oven safe to 450 degrees Fahrenheit and compatible with gas, electric, halogen, and glass ceramic stoves. However, it’s not that convenient for induction cooktop, and you’ll need to use this pan with nylon or wooden utensils to secure the non-stick surface from damage. Although the manufacturer didn’t use any harmful nonstick materials, health conscious people may still unlike it. The best thing about the Vremi Pre-seasoned cast iron grill pin is it comes with a heat resistant silicone handle cover to ensure maximum heat resistance. Now you can easily pull your pan even at the highest temperature. 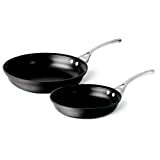 As it is a pre seasoned pan, it’s naturally nonstick without any use of nonstick compounds. The manufacturer used vegetable oil rather than any enamel for seasoning. It’s completely hygienic and you can always re-season it if you want. Oven safe to 480-degree F and compatible with any kind of cooktop including induction and magnetic cooktop. Body material: Sauce and saute pans are usually made of stainless steel or aluminum. There are also copper and cast iron saucepan, but they’re rare to find. Stainless steel pans are durable compared to aluminum, and they’re usually dishwasher safe. Besides they’re compatible with induction cooktop and much durable. Core: Stainless steel pans have lesser even heat distribution capacity than aluminum. That’s why most brands add an aluminum core in the middle of interior and exterior base for much faster and even heat distribution. Make sure the pan comes with an aluminum core otherwise you may take much time to get your cooking done. However, you don’t have to worry about this feature if you buy an aluminum one. Nonstick: Nonstick pans allow easy release and no sticking of foods when cooking. They’re much convenient and easy to clean. But, some nonstick materials are harmful to health, and they can contaminate your food. Make sure the pan is free of PFOA and other unhygienic materials to keep you safe. Besides they’re not dishwasher safe because soap or detergent damage the nonstick surface. If you’re a health conscious person and don’t trust the sweet words of sellers, then you should go for a pan with no nonstick feature. It might stick food, and you would require much time for cleaning, but you will feel safe. Handle: Stay cool handles are much convenient, and they allow easy pulling at any heat level. Handle made of heat-resistant material or coating are safer than stainless steel or aluminum handles. But they are less durable compared to steel and aluminum handle and may break down after months of usage. Material: Skillets can be found in cast iron, aluminum, or stainless steel material. However, cast iron skillets are most popular as they’re thicker so foods don’t burn when frying. Besides they’re highly durable and easy to clean and maintain. Pre-seasoned or not? : When buying a cast-iron skillet, you would want a pre-seasoned one, so you don’t have to season it after buying. Seasoned skillets are non-stick so they’re more convenient and allows fast frying. Besides, seasoning requires vegetable oil rather than artificial compounds, so they’re hygienic. But cleaning with soap or detergent will damage the seasoning, and you’ll need to re-season it. However, iron skillets can be easily cleaned by hand wash and hot water. Body material: Grill pans are common in cast iron and skillet. Both are convenient with different features. Cast iron pans are heavier than aluminum, but they’re way more durable. You can go over a decade with an iron pan when an aluminum pan can serve you only a few year. Nonstick: If you want a nonstick cast-iron grill pan, then make sure it is pre-seasoned. For aluminum, make sure it comes with a nonstick surface. Being pre-seasoned is not so important for an iron grill pan as you can always season and re-season it after buying. But, aluminum pans don’t have this chance as you can add the nonstick coating on the surface after buying. Whether you’re buying a saucepan, saute pan, skillet, or grill pan, make sure it is compatible with your cooktop especially if you have an induction or magnetic cooktop. Pans are usually compatible with all kinds of cooktop except induction or magnetic. Such cooktop requires pan with magnetic surface otherwise it won’t be able to heat the pan as well as the food. Stainless steel and cast-iron pans are compatible, but aluminum are not. So buying an aluminum pan will be worthless if you plan to use it on your induction cooktop. If you still plan to buy one, make sure it has a stainless steel surface. 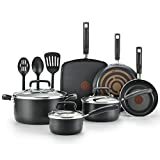 If don’t mind to spend some money more, you can see best cast iron cookware set here.